Weekly Roundup: Unauthorized Redirects, Branded Content Ad Prices, and More. We believe GDPR will make the ecosystem better. Publishers have shed the supply-side vendors, According to DMA UK, post-GDPR, 61 percent of internet users said that they’re happy with the amount of personal data that has been shared and more than half of them acknowledged that data is an integral part of the digital economy. On the other hand, data privacy authorities have been criticizing RTB and raised complaints too. To put it simply, GDPR has pushed the industry to go out and proactively clean the convoluted automated system we’ve built. More recently, Digiday wrote that unauthorized redirects are troubling the publishers, post-GDPR. As per the research by RebBud, several vendors are capitalizing on the fact that publishers can’t manually analyze every redirect made from their users’ browsers. The firm studied the top 30 UK publishers and concluded that a dozen sites allow redirects to the vendors without GDPR policies (not directly, but through intermediaries). This, indeed, will put both publishers and legitimate vendors at risk. The study flagged vendors named “Upravel” and “Slowplay” as suspicious and potentially illegitimate. IAB Europe lists 400+ vendors in its global vendor list. From our ads.txt study, we know most of the supply is accrued towards a handful of exchanges and resellers account for more than 60 percent of the ads.txt lines. If everyone has a strict filtering process and mandates that their partners of partners should also be GDPR compliant, then we could get rid of a fair share of unauthorized redirects. Sidenote: Top publishers will face increased fraud rate as the impressions are capable of commanding higher CPMs. So, the top 1 percent has a lot of work/responsibility than the rest. If that sounds like a stretch, we’ve OpenRTB 3.0 coming up. And (it goes without saying), only the complete supply-side, not just the publishers can get the job done. It all started with banners. CPMs of banner ads stayed above $10 and sometimes, went up to $80. When everyone demanded scale, the price wasn’t as lucrative as it was before. Today, we can only expect Google to slip yellow ads to have the same CPMs. Now, sponsored content is going through a similar cycle – at Digiday Publishing Summit, publishers said they’re grappling with the reduced margins of the sponsored content. But wait, aren’t sponsored content supposed to get better ad prices? You’re right. In fact, they still do. But when almost all the top publishers decided to run sponsored content to capitalize on the growing demand, ad prices rarely do stay the same. For instance, Neil Vogel, CEO of DotDash said venture-backed publishers (who can burn more money than they earn) woo the advertisers with the discounted prices for the more or less the same story/audience. PopSugar’s content studio – the Bakery also have to compete against the VC-backed publishers. – Michael Finnegan, the president of Atlantic Media. In addition, publishers have to figure out how to distribute the content to get more users. With Facebook deprioritizing news content and becoming expensive, it’s getting harder every day to distribute. Agencies still see the campaign using the same metrics as they do for banner ads (such as effective costs per view) and it is exacerbating the situation for publishers. The cost of producing high-quality content isn’t anywhere near that of other ad formats. When there are cheaper options, agencies tend to try it out. After all, the job is to get the ROI as high as possible. Exclusivity pays well. As a publisher, it’s time for you to stand out with first-party data, engaged audience, scalable and repeatable distribution models. It applies to sponsored ads, banners, video ads, and everything you try to sell. Almost a year ago, we saw that the ad viewability of the publishers in the UK wasn’t on par with the other markets. Last week, Integral Ad Science (IAS) said that the programmatic ad buys recorded better viewability and is close to direct buys. Here are the highlights from the report. – As you could see below, both in desktop and mobile web, programmatic ad viewability of display ads was just 2% lower than that of direct buys. In fact, time-in-view of programmatically bought ads are better than the ads bought via direct buys in desktop display, mobile display, and mobile video. – Desktop Skyscraper unit (160×600) scored the highest viewability and time-in-view. As the buyers are trying to get 100% ad viewability as the MRC standard, publishers have no choice, but to optimize for viewability and time-in-view. Though there are multiple studies depicting that the current viewability and time-in-view are effective, advertisers seem to strive for the maximum number. And, there’s a point. If you’re paying for only the best ones, the ROI would shot up. The best way to deal with the viewability is to deliver the experience and then utilizing the opportunity to serve viewable ads. Recession, privacy, economic slowdown – nothing will hamper the growing digital advertising says eMarketer. As per the source, digital advertising will increase by 17.6% to $333.25 billion to capture half of the global ad market. Countries including the UK, China, Norway, and Canada have already experienced higher digital ad spends than the traditional medium. 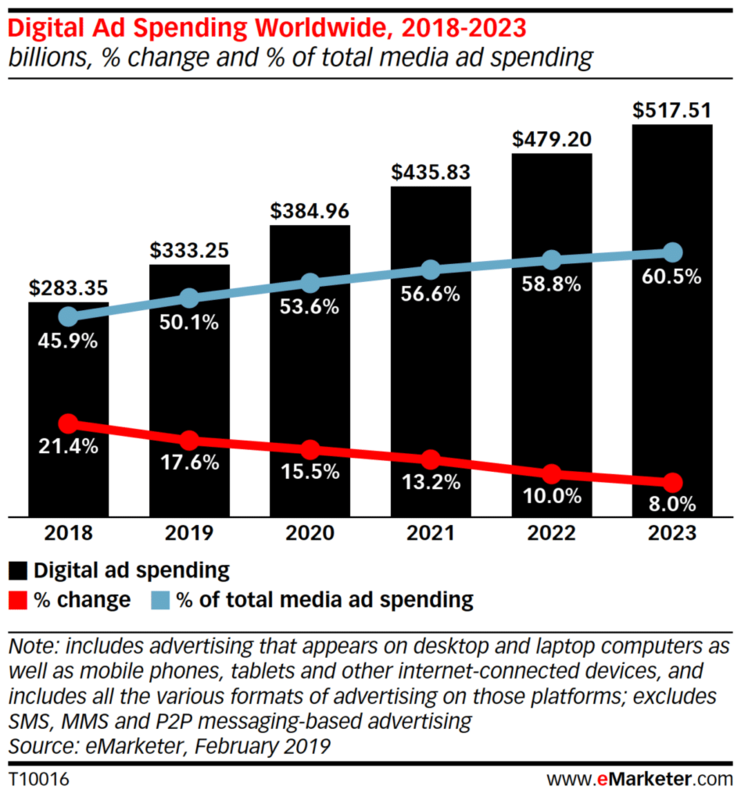 This year, the US and the Netherlands will be part of the cohort as both are expected to see 54.2% and 52.6% of the total ad dollars directed to digital, respectively. – Jonathan Barnard, head of forecasting at Zenith. 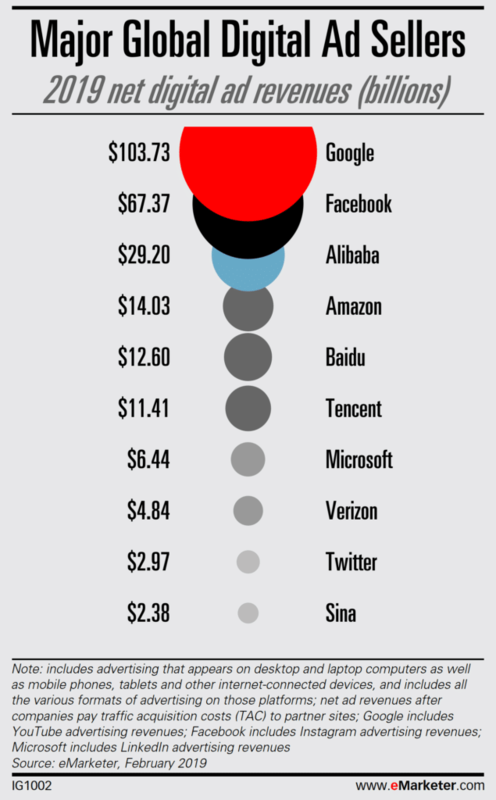 Google and Facebook will remain the top digital ad sellers. Google will capture 31.1% of worldwide ad spending, or $103.73 billion and Facebook will reap $67.37 billion in net ad revenues. Amazon, though comparatively smaller, will accrue $14.03 billion in ad revenues. Now that we know digital ad dollars will be half of the total ad spend, we’ll naturally look at the duopoly and Amazon next. Both Google and Facebook are having their own problems to deal with – Scandals, data breaches, Anti-trust regulators, etc. Amazon, too, will have the saturation and considering the push from Walmart, it’ll be sooner than we all think. How Will Google’s Move To Restrict Third-Party Cookies Affect Publishers? 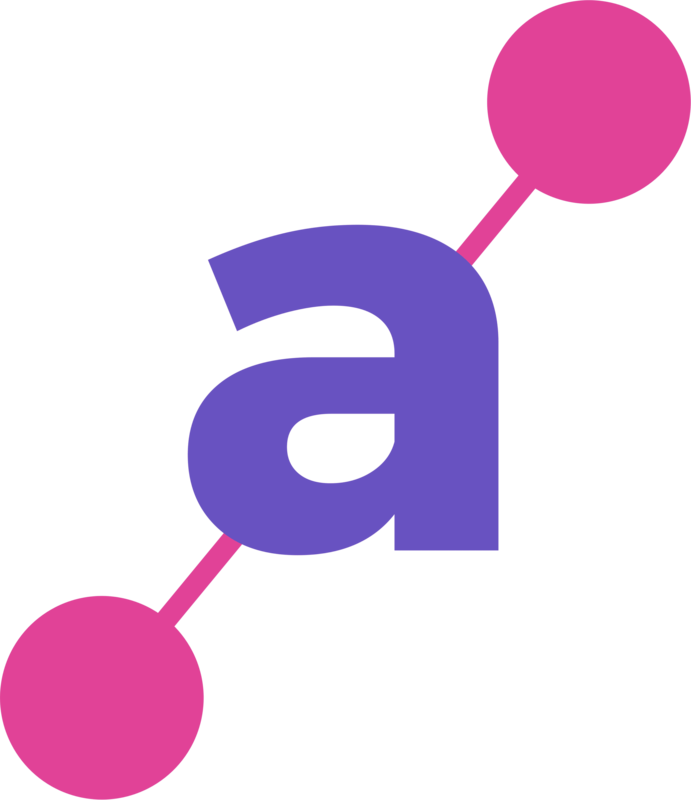 – AdExchanger. Consumers reveal their digital concerns – WARC.